I have been testing a few different strings lately and one of them is HEAD Hawk Touch. It was developed with input from ATP players and it takes about five minutes hitting with HEAD Hawk Touch to understand why. It is a string that is all about CONTROL! Here is my HEAD Hawk Touch string review. HEAD Hawk Touch is round poly which is somewhat refreshing in a time where most string producers brag about how many sides their strings have (I think “octagonal” is as far as they have come). The issue I experience with shaped strings is that they wear out faster, and quickly lose what made them great in the first place – spin and control. With HEAD Hawk Touch, it is not so much about the fantastic spin generation, but more of an emphasis on the control aspect of the string. Something it does well as you will see in this HEAD Hawk Touch string review. 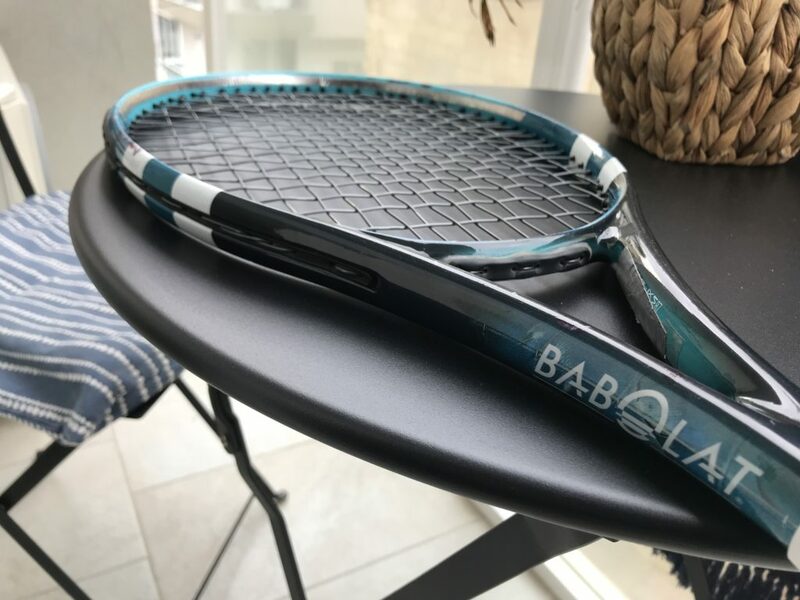 I strung up HEAD Hawk Touch in two different racquets – one a 95 sq inch control racquet (HEAD pro stock) and one Babolat Soft/Pure Drive. It was clear from just a few minutes of hitting that this string was better suited in a power racquet like the Pure Drive. In the control racquet it played too dead and although I like control strings, I did not enjoy the feel on impact. In the Soft Drive however with its open pattern, I really appreciated the control the string provided. It was relatively soft for a poly string too, but the durability was about average. I would say you max get about 8-10 hours play in a more open pattern. What I did enjoy about this string was the control and the touch. Since I am used to playing with control-oriented and heavy racquets and I am trying to transition into more powerful frames like the Pure Drive, this was a string that really helped me “feel” the ball and it was very nice for caressing drop shots and drop volleys with. I also felt that if you do already hit with spin, the string will offer good snapback and play along nicely. What I did not love so much was the feel on contact. It is hard for me to describe but the string feels thinner to me than it is. I almost had the sensation of playing with barbed wire. Despite that, my results with this string were good and I felt I had control of the ball. So it is with mixed feelings I rate this string. I will for sure play with it more and see if it changes my opinion of it. But I would say this string is definitely made for advanced players who want maximum control and good touch. If you like livelier strings that provide some extra spin and power, I would recommend the Laserfibre JB Tour 100 , which is my next string review! If you want a poly string which is all about control, I would definitely give HEAD Hawk Touch (link to buy) a test. 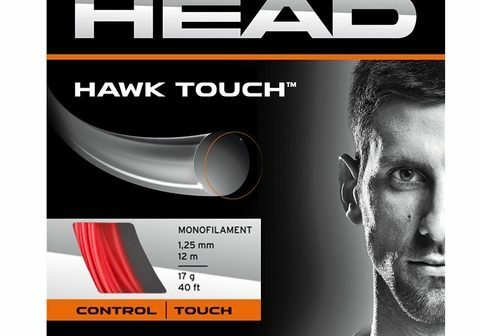 Have you tried HEAD Hawk Touch? What did you think about it? Please comment below! I demoed a Head Radical MP with a Head Hawk string. Totally swayed me away from Radical MP towards Speed MP because I couldn’t feel where the ball was going, and consequently couldn’t correct my shots. I don’t like this string at all. It was fantastic in the Radical Touch Pro I demoed. I’m going to try it in my weighted Vcore Tour G. I’ve been using Poly Tour Pro mains, Micro Sheep crosses and it’s the right amount of pop, feel and control. But just like written specs, you have to try things. Based on TWU numbers on Tourbiite 19g ,I thought it would be the a wonderful string. But not so much in the plush Tour G. I’m just gong to stay away from any rough/shaped strings. I think they take a lot of touch out of the ball. One Tour G came with MSV Go Max 16L and that was really a nice string. Not too grippy, a lot of control and at 57 lbs did not agitate my arm and did not have to swing for the fences. Can’t say that about TB 19. I’ll def try the HHTouch, but just hope it’s not too dead in the Tour G.